Hockey 123 is open to children ages 5 (could start at 4 if they have participated in our Tiny Tot class lessons) and up who are interested in learning to play hockey. It is heavily recommended for children to have already completed a skating class: Tots, Youth Beginner 1 Learn to Skate, or another comparable class at another rink. This class is an excellent introduction to the fundamentals of hockey skating. The class is divided into three levels: Hockey 1, Hockey 2, and Hockey 3, with corresponding increasing levels of difficulty. Hockey 1 focuses on the basics: getting comfortable in your skates and equipment, how to fall, and beginning skating techniques. Hockey 2 focuses on developing power in skating techniques, control over movement, and backwards skating. Hockey 3 focuses on refining skating techniques, backwards skating, edge work, and the beginning use of pucks. Skaters will be sorted into groups in the beginning of the session, or when they join. Each level of Hockey 123 has recommended skills provided by USA Hockey that will be used as benchmarks for appropriate level placement. Upon completion of Hockey 3, skaters will have the option of joining the Sharks Ice Youth Hockey League In-House program. We offer rental hockey equipment at no cost while the players are registered for classes (more information below). Skate rental is not included in the price of enrollment; full hockey equipment is required. Please contact the Hockey Department - CLICK HERE - for information on rental gear. 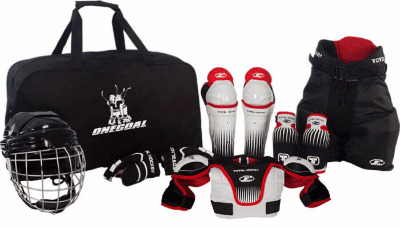 We are offer Hockey 1,2.3 participants the opportunity to take gear home as part of their participation in one of our hockey programs with a signed Rental Agreement and Equipment Waiver at no cost. If the gear is not returned you will be charged for the items items checked out. Gear is distributed on a first come, first serve basis. Participants will be fitted for gear the first week, and the gear is their to take home for the duration of the class. All borrowed gear must be returned at the end of the session unless they will be continuing in the next session. Depending on the number of registrants, and due to our limited gear available, we cannot guarantee the availability of equipment. Skates used for the class must be rented and returned after each class. If borrowing gear, please plan to arrive at a minimum of 60 minutes prior to the start of class to receive your gear and get your child dressed so he/she can be on the ice on time. it is recommended to schedule an appointment to receive gear prior to the first class. SKATE RENTAL IS NOT INCLUDED IN THE REGISTRATION COST & EQUIPMENT RENTAL – 12-session skate rental books are available at the front desk at a discounted price of $50 (12 skate rentals for the price of 10). Check out our Lesson Page for all Class Lesson Information! Dalziel Garage: Free parking is available for all OIC patrons at the Dalziel Garage on 15th Street between San Pablo and Clay Streets (1 block from the rink—see map below) from 4pm to 1am Friday evening and Saturday from 8am to 1am. Please make sure to request validation upon entering the garage in order to receive free parking during these hours. 18th & San Pablo Surface Lot: Parking is available in this lot for up to four hours, for a fee of $2 per hour. PARKING IS FREE IN THIS LOT ON SUNDAY.